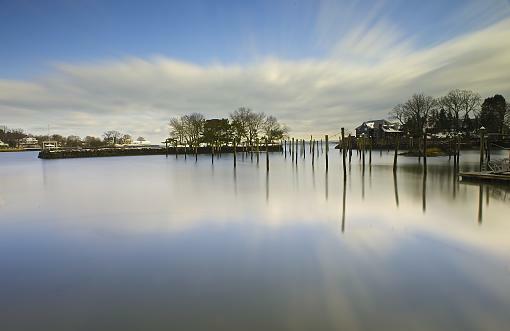 Long exposure of a Harbor about a month ago. Welcome to the forum!! I enjoyed your photo very much! Would you care to share some specifics about your exposure details. It's not often you get daytime shooters who do long exposures. Your scene is interesting, I like the placement of the horizon, although it may need a bit of horizontal leveling. Defintely ike the feeling of motion from the clouds and reflection. Overall, a really fun photo to critique. Thanks! Hello and thanks for sharing. The horizon is a little off (down on the left side). I would consider cropping away the about 1/3 of the image on the left side, because it does not add much to the scene. The wood poles and the moving sky are much more interesting, and this would help focus it in on that. The pier on the right side is a little distracting as well. Otherwise, I find it a pleasing image. Thanks! You're getting me dizzy Zoelav. Nice effect! I love the way the water is soft but retains enough of the 'exploding sky'. The apparent tilt makes me wonder if that is intentional or artistic? Sometimes adding a little tilt can be good, adds pizazz, flair, etc. The mid ground elements seem a little dark, perhaps they could be lightened a tad. any 1 heard of the HVC in Pepin, WI...? ?